With the original Dove being released back in 1962; the new Epiphone Dove Pro Electro Acoustic Guitar comes from a strong lineage. Now equipped with the Fishman Sonitone and Sonicore System, the rock and roll icon can hold its own alongside drums and electric guitars, while unplugged it is still more than capable of fronting an acoustic band. Classic Dove sound is offered by the Epiphone Dove Pro’s combination of a solid spruce top, noted for a richness that improves as it is played in and as it ages, and select maple back & sides with an offering of a bright, punchy tone. The top has been finished with a warm, vintage-looking Violinburst and a 5-ply white and black binding, while the back of the body is kept simple with a single-ply white binding. The Epiphone Dove Pro Electro Acoustic also features the classic “Dove” tortoise shell style pickguard. Joined to the body of the Epiphone Dove Pro with a dovetail joint, and glued-in with Titebond glue, is a hard maple neck shaped to the SlimTaper "D" profile. Between the 1.68” nut and carved rosewood bridge, with its pearloid dove inlays and compensated imitation bone saddle, is a 12” radius, 20 medium-fret rosewood fingerboard with pearloid parallelogram inlays and a singly-ply white binding. The guitar has also been kitted out with Grover 14:1 tuners and nickel strap buttons. Ensuring the natural tone of the Epiphone Dove Pro Electro Acoustic Guitar is still communicated when amplified, Epiphone enlisted the help of pickup industry leaders, Fishman. With the Fishman Sonicore equipped under the saddle and the Sonitone preamp discreetly mounted in the soundhole, the guitar offers the same acoustic tone its known for even when plugged in, without spoiling the aesthetics of the guitar. Although in the soundhole, the preamp is easily accessible and offers Master Volume and Tone controls and will typically last up to 100 hours with one 9-volt battery. Posted on 30/12/2018 by Slush I shop at the Liverpool branch and thay are a pleasure to deal with. Bought a Dove last wk and they couldnt be more helpful and polite, great guitar too. I play weddings and corporate events so need pro sounding gear, this guitar is both that and well priced. Posted on 21/08/2018 by Antony Purchased one from Reading store yesterday, great guitar, sounds and looks great and easy to play, for the money its a very good deal, havent plugged it in yet only played it as is and it is a dream to play, very happy with my purchase and new guitar. 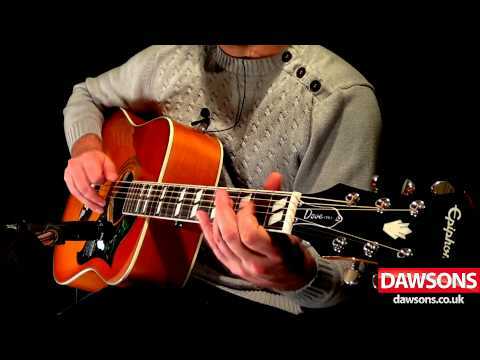 Posted on 27/03/2016 by Paw1977 I was amazed at how good the epiphone dove pro sounds! The sound fills a room effortlessly and with the fishman pre amp you get a very good wide range of tone when you plug in! Iv wanted a decent acoustic that was in my price range for a while now, this one definitely fits the bill! The action is so good you would be forgiven for thinking you were playing an actual Gibson! As for Dawson's, Iv really fallen in love with this shop! Friendly staff that won't hesitate to help! Excellent!!! Posted on 19/11/2015 by tjdrummer I visited Dawson's last weekend intending to purchase an Epiphone Hummingbird Pro. When I tried them both out I preferred the brighter sound of the Dove Pro and was then shown one reduced by 20% due to what I can only describe as a minimal cosmetic blemish on the headstock. This showed highly professional and honest retailing and I left with a beautiful looking and beautiful sounding guitar at a steal of a price! All in all an excellent shopping experience. I like Dawsons!